The reason that I look forward to the New Year isn’t champagne, or the national holiday. It’s the chance to make a fresh start with a new vision collage. Last year Darren, my friend Jamie, and I got together to make collages and presented them to each other. 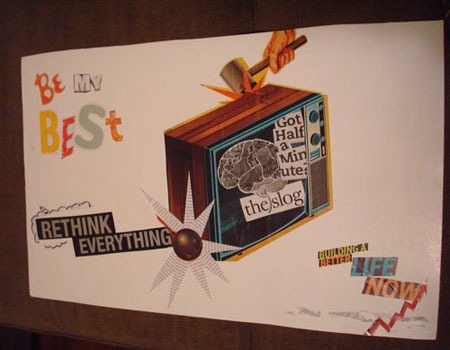 On New Year’s Day this year, we shared our 2010 collages again before explaining our new ones. There’s something about cutting out a picture of what you want to create in your life and gluing it to posterboard that brings you closer to it. I found it fascinating how we’d achieved most of our 2010 goals (see mine here). Jamie found the man she wants to marry, and I got engaged to mine. Darren launched Creative Distillery, our creative agency, and he ate a steak (yes, that was actually one of his goals). It’s also fun to see how each person’s collage reflects his or her personality. Darren’s was so graphically stylish that it could hang in a modern art museum. Jamie’s was organized and precise. Mine was colorful and filled the entire canvas. 1. Blessings. The words in the center are from “Real Simple,” which asked its readers to name what they were grateful for, then compiled their answers. Glancing at these words remind me to be thankful for blessings like my family, laughter, Friday, and chocolate. 2. Personal strength. I’m committed to taking up more space in a room (figuratively, not physically!). We could all learn something from Oprah. She is a role model who capitalizes on her own power and uses it to help other people become their fullest selves. 3. Pitching and publishing. 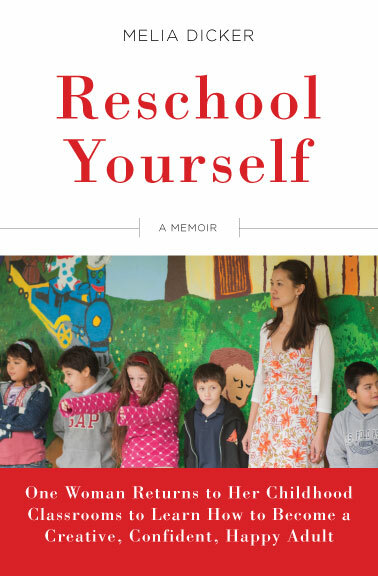 I’m pitching the “Reschool Yourself” book at the Writer’s Digest conference in New York tomorrow. I’ve decided that 2011 is the year that I make the book happen. 4. Personal finance. It’s an ongoing challenge for me to manage my money. Look at George. He’s happy. I will be happier, too, when I become better friends with him. 5. Healthy lifestyle. This has vastly improved since I moved to Mississippi, but I still could enjoy the outdoors more often, have coffee with my girlfriends, laugh about my kittens’ antics, stretch, sleep, and smile. 6. Explore the South. I often travel outside the state but haven’t explored many nearby destinations. This year I’d like to take scenic drives to Natchez, Oxford, Memphis, and the Gulf Coast. 7. Appearance. One of my New Year’s resolutions is to wear at least one accessory per day, even if I’m working from home. Dressing up a little makes me feel good about myself and more pulled together. 8. Organization. “Declutter Your Life” is another ongoing challenge for me. I’ve invested in Rubbermaid tubs and filing cabinets to clear clutter from surfaces, and I usually abide by my friend Sara’s “touch mail once” rule. Dealing with it right away prevents those dreaded stacks of old mail that stick around for ages. 9. Volunteering. The picture of the little girl represents my desire to volunteer. Those of us who work for nonprofits tend to think that our paid work takes the place of volunteering, but there’s something different about giving one’s time for nothing but the joy of it. I think I’d like to read to children. I miss being around them. 10. Training my brain. With all the distractions I deal with every day, my focus and memory have suffered. I firmly believe that you can get a flabby brain into shape, so I’ve bought new books of crossword puzzles and brain teasers to do just that. I’ll be refreshing my Spanish to help scale up IDEA’s education work in Puerto Rico. There’s nothing like learning a foreign language to exercise one’s mind. I’m going to hang the collage above my desk, as I did last year, to put me back on track when I lose my way. I’m already looking forward to next year’s collage so I can see what I was able to manifest in my life. 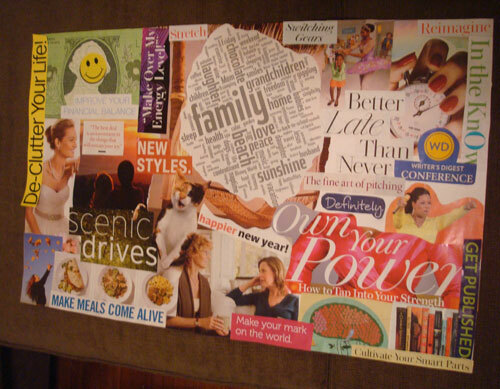 Have you done a vision collage or a vision board? What was your experience like?